Average Height	: 10" - 15"
Average Weight	: 13 - 17 lbs. Photo Courtesy of : Russell Rescue, Inc. The breed was named after a clergyman named Rev. John Russell. It was used as a small game hunting dog particularly for red fox, digging the quarry out of its den in the mid-1800s. On English hunts, the dogs needed to be long-legged enough to keep up with the hounds. Breeders had emphasized its working ability, so the standard was very broad, allowing a wide range of accepted body types. Not happy with this wide variety of working type Jacks, as of April 1, 2003 the Jack Russell Terrier Association of America was changed to the Parson Russell Terrier Association of America. The working types remained Jack Russells while the American show types became known as the Parson Russell Terrier. Some of the Jack Russell's talents include: hunting, tracking, agility and performing tricks. •	Cheerful, merry, devoted and loving dog ~ spirited and obedient, yet absolutely fearless. •	Energetic indoors & outdoors ~ bouncy/great jumpers. •	Great escape artists, with even the best fenced yards. •	Not suited for apartment/condo life. Can be ‘barkers’. •	If socialized in puppyhood good with other dogs, otherwise can be feisty with other dogs. •	Not great at being left alone, can suffer from separation anxiety. •	Not an outdoor dog, prefers to live indoors with the family. •	Like many terriers Jack Russells enjoy digging and can make quite a large hole in a short time. •	Have a strong prey drive to chase smaller animals. Never trust off leash. •	Make excellent partners for joggers, hikers, bikers. •	Generally great with kids. •	Needs to learn to understand and respect rules and boundaries. •	If allowed to ‘rule the pack’ can become guarded, snappy and obsessive. •	Intelligent and highly trainable. •	Have strong hunting instincts and kill easily. •	Thrive with being given jobs to do. These dogs can become destructive if they are restless or bored, and it is important that they have plenty of activities to enjoy when they do not have access to formal exercise. Regular activity will keep them from becoming occupied in harmful actions and activities overall. The Jack Russell Terrier is a natural climber and can jump and climb over fences relatively easily. These dogs do get excited very easily and are strong-willed; they will do their best to achieve a goal and will run after new things easily. Making sure they are well-trained well before they have a chance to do so is in the owner's best interest. These dogs are very loving and affectionate, and will need constant attention. They will turn to excessive barking and other unmanageable behavior if they are not getting the attention they need, and may even resort to digging and destroying objects in the home. It is important to vary their activities and make sure they are actively engaged with the family on a regular basis. These dogs do have a tendency to be "cat-aggressive" and will not get along well with other small animals in the home. They often get involved in fights with rabbits and other small fur-bearing animals so it is important that they are kept far from the cages of any household pets as often as possible. These dogs are inquisitive and curious, and due to their small sizes, can find themselves in a lot of trouble very easily! It is important to remember that these dogs do not enjoy being "lap dogs" and would rather play about freely. They are not comfortable sitting in one place for extended periods of time, and will need to be taken to new environments and settings on a regular basis. The Jack Russell Terrier is very easy to groom, and will need to be combed or brushed about once per week. A firm bristle brush is all that is necessary to maintain their clean and healthy coat. For owners who use the Jack Russell Terrier as a showdog, professional services and grooming will b necessary. The Jack Russell Terrier's coat does not tangle easily, and has a soft and natural feel to it. The coat will need to be brushed out on a regular basis, and it is important to use a softer brush on the undercoat. In much the same way as rougher coats, the dog may need to be stripped completely during various seasons. 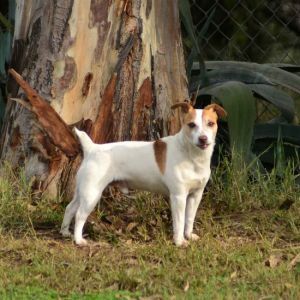 The Jack Russell Terrier is very adaptable to different environments, but does require a lot of exercise on a regular basis. Owners can expect to become athletic and build endurance themselves; these dogs enjoy running, walking, and jogging outdoors as well as playing standard games such as fetch or with a ball. Since they are constantly active indoors as well, these dogs need plenty of stimulating toys and activities during "rainy days." They tend to become destructive and irritable if they are bored, and it is important that they are given the freedom to run and play about if they are inside for extended periods of time. The ideal workout for these dogs is about two long walks or light jogs per day. These dogs are naturally early risers and will expect to get exercise immediately after waking. They need open spaces to run, hunt, play, and explore; taking them to a dog park or other open field for a day is perfect for fulfilling their exercise needs. These dogs are quick learners and highly intelligent. Although they may run off from their owners, they can return quickly after careful training. It is important to keep them on a leash until they are well-trained so that they do not get lost. These dogs have superb stamina and endurance, and older owners may have difficulty keeping up. Naturally hyper and overactive, these dogs are relentless when finding physical activities to participate in! The Jack Russell Terrier is a smart and intelligent breed of dog, and can learn new tricks and skills very quickly. They respond well to basic training but they may be difficult for the average person to train. These dogs require patience and consistent training; they are sensitive to tone and command and they are especially receptive to affection and attention. When training the Jack Russell Terrier, it is important to remember that they have a tendency to be hyperactive to the point of becoming unmanageable. These dogs require consistency throughout their formative years, and they do not perform well with harsh correction or criticism. In fact, these dogs will simply freeze or become upset. It is important to keep training to 2-3 sessions per day, and keep them brief and short. These dogs are sensitive to sound and movement, and will not respond well when they are overly anxious. The Jack Russell Terrier loves to learn new things, and will adapt well to a variety of settings and environments. It is important to combine training with play for these dogs as they will respond well when they are interacting positively with a variety of activities.